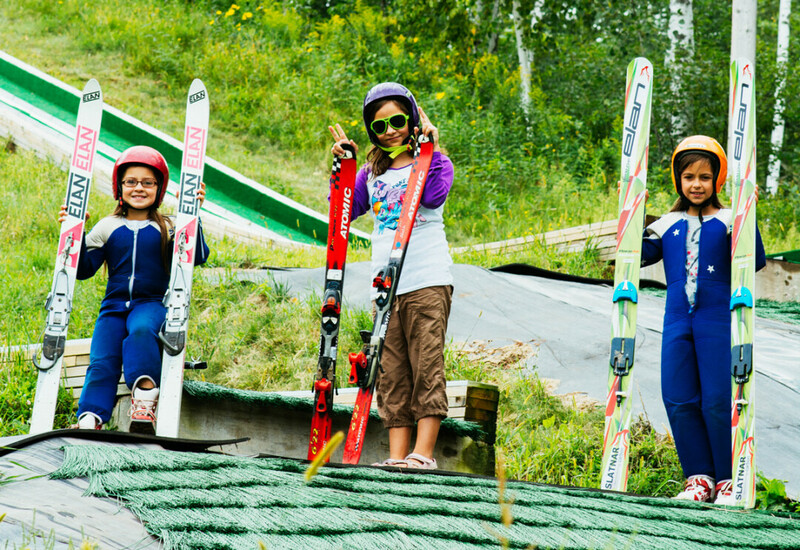 Entering fifth grade this fall, Megan – along with her twin sister Jewel and her younger sister Greta – is a member of the Flying Eagles Ski Club in Eau Claire. Megan competes in area ski jumping events, with weekly practices in the wintertime, and she uses the club’s off-season training grounds on Mt. Washington (pictured) during the warmer months. Last season, she scored a first place finish in the 15-meter jump for girls in her age group. A busy mother of four, Tammy said their schedule only allows time for a handful of activities, so it’s nice when the kids choose the same one. “Well, at least it is for Mom and Dad!” she joked. To many, ski jumping looks intimidating all by itself, even without the pressure of a tournament. But Megan likes the competition. “It pushes you harder to be more confident while trying to win,” she explained. Megan Sauk (far right) with her twin sister Jewel and her younger sister Greta.